Paloma has her own basil plant and takes care of it with pride and a funny crinkle of seriousness on her forehead. 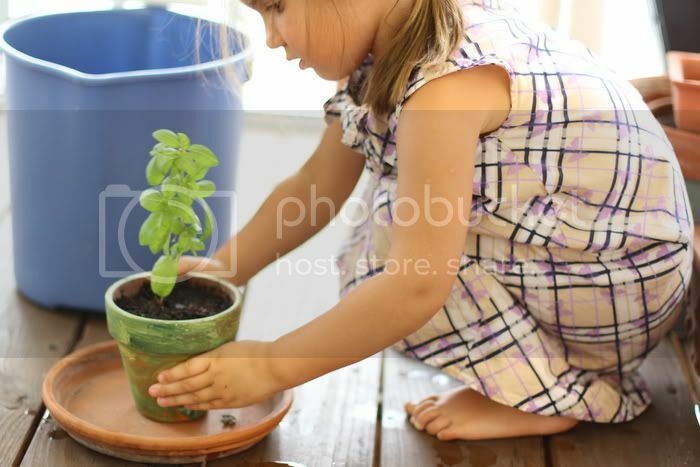 She planted it and painted the pot green with the help of her daycare teacher. Things like these always leave me wishing for a big backyard and a garden for her to play in and learn from. Sometimes, when she is not looking, and when I want to give my bigger basil plant a break, I sneak some of her herb for our meals. I did for this pad thai. I’m not sure why I didn’t share this recipe earlier. It has been a staple dinner for us for a while now, very quick and easy in preparation. I don’t always make it with white crab mushrooms, but found them at an Asian market the other day and couldn’t pass them by with a name like that. Kelp noodles, something I always have in my pantry, are made out of sea vegetables, which automatically makes them very nutritious. They are neutral in taste, noodle-like in texture, and absorb any sauce they are in. Overall, a great way to enjoy the benefits of seaweed. Here, the flavours of coriander, almond butter, and coconut oil work wonderfully with fresh herbs and baby bok choy, making one of my favourite dinners. 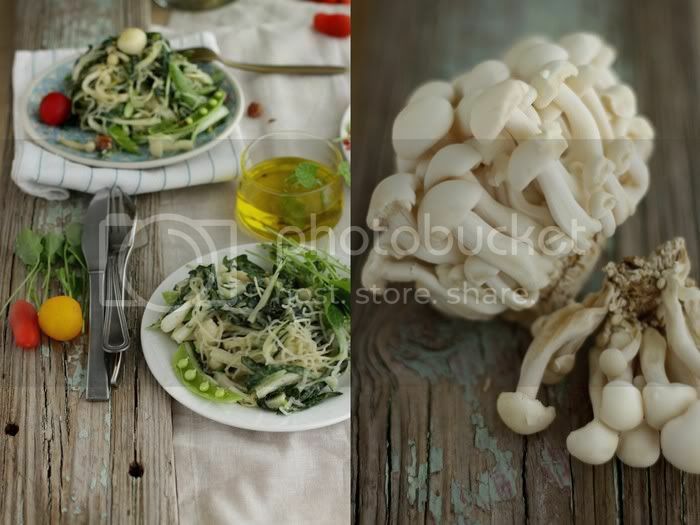 Sprinkle the mushrooms and bok choy with olive oil, salt, pepper, and toss to coat. Spread on a Teflex-lined dehydrator tray, and dehydrate for 1-2 hours at 95F. In a high-speed blender, combine all the ingredients with the exception of kelp noodles to a smooth, sauce-like consistency. Drain and wash the kelp noodles, and cut them into shorter pieces if you like. In a large bowl, combine the noodles with mushrooms and bok choy. Pour the sauce over and mix thoroughly. Optionally, add fresh green peas, basil, and/or mint leaves. 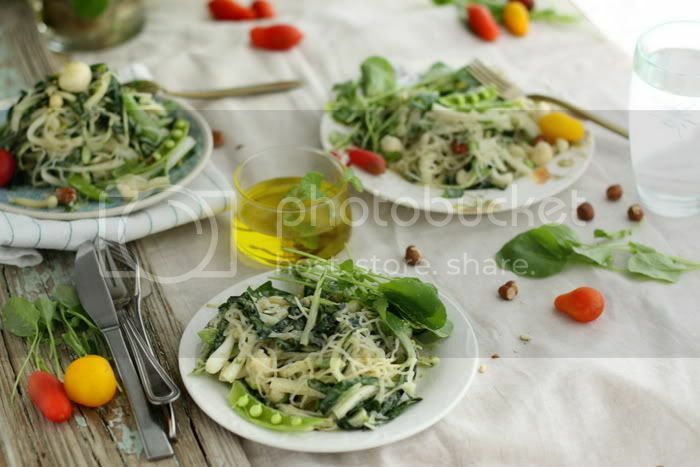 Sprinkle with chopped pistachios or hazelnuts and enjoy. Incredible recipe! I can’t wait to try it! What a vibrant and nourishing meal! Looks delicious and your daughter looks so sweet! Thanks for sharing. Looks healthy and very delicious. I like the flavor combinations. I’ve never cooked with kelp noodles but with Pad Thai its all about that delicious flavors. Beautiful photography, and what a lovely daughter you have. The recipe sounds amazing. love the combinations and this is without a doubt the healthiest Thai dish I’ve ever come across. Easy, I am going to make it! Oh wow, I love your idea! What a pad thai!!! I’ll do it very soon! Mmmm, sounds tasty! I’ve had an obsession with bok choy lately and can’t seem to eat enough of it. This recipe will provide a needed departure from pulling the leaves off the head and eating them straight away. And I love anything “Thai” so I can’t wait to try your wonderful recipe. Thanks so much! I have almost everything in my kitchen except for the mushrooms and the noodles. But I’m thinking I’m going to try with spirialized zuccini. Oh wow! I will try this as soon as I can get my hands on Kelp noodles. And I agree with Paloma, there is something really special about caring for baby basil plants! Ok, Yup – this right up my alley! Love the colors, the plating – and of course, love that it’s Asian inspired :) I’ve never heard and/or tried crab mushrooms -but they remind me of a fatter version of the enoki mushroom – I’ll have to hunt them down! Love the simplicity of this pad thai and the beauty of this dish!! 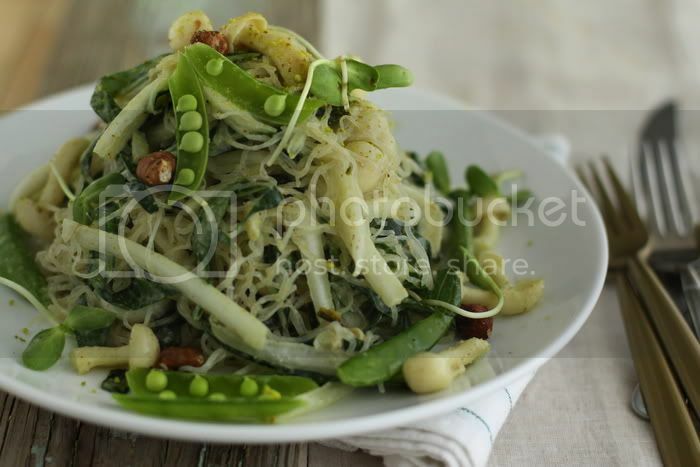 I will make this for sure, we adore kelp noodles and have yet to try sea spaghetti–found it on line just need to order it. I can get kelp noodles at the local store, so that is goog. Another lovely post! You mention wishing for a garden. Be careful what you wish for! I have a big garden and we eat a lot of its produce, but it takes time and work, so I have less time for my blog and for raw food invention. Balance has its costs :-) Anyway, thank you for this post. I grow Asian veggies in the winter. Peas as well, so this will be a perfect winter recipe. I can imagine warming it in the dehydrator on a chilly winter day. I’m sure it will be delicious! Beth, I can’t say if they are better, but for our purposes (raw food), we use kelp noodles because they are raw. Sn, thanks! They are very neutral in taste, in my opinion. Nothing fishy. Very interesting recipe… Such a wide array of flavours and textures… Definitely putting this one on the “To Try” list! I love this type of food! The photos are wonderful! Congratulations. I just made this and it was really yummy, I added shredded carrots and green onions to make up for omitting the mushrooms (which I don’t like), still turned out good. I’ve never had kelp noodles, it took a little bit to get used to the texture but once I knew what to expect I was able to enjoy it. I just prepped my husband by saying they were crunchy noodles and didn’t tell him they were kelp until after he was done and had said he liked it. What a cool variation! I have my own variation on the ubiquitous Thai dish! yours looks amazing though! white crab mushrooms!